Wall Street in New York - the Stock Exchange. 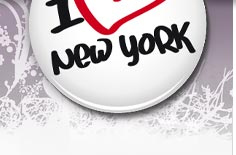 Address: Wall St., New York, NY 10005 (Between Broadway and Front Street). No street in New York is so important as Wall Street. The Street is the main business centre and are famous for the worlds financial district, with the Stock Exchange as the main point. The street has got it´s name from the earlier fort with it´s protected wall, who were placed here in the area (approx 1633). It protected Manhattan from earlier enemies and war seeking indians. Before the European settlers came to Manhattan the area was called The Wiechquaekeck Trail, then it was an old trade road for Algonquin indians. The area is a mixture of old colinial buildnings and tall skyscrapers, it was here in these parts (south Manhattan) where New York was founded. Today this area is the centre of business with the Stock Exchange as the central point, but for the historic interested person there are many other things to see here as well. Close by you will find the Federal Hall National Memorial. The place were George Washington swore his first president oath on April 30, 1789. Today's building is from 1842, when the former house was demolished in 1812. Today the building is a museum and historical memory. 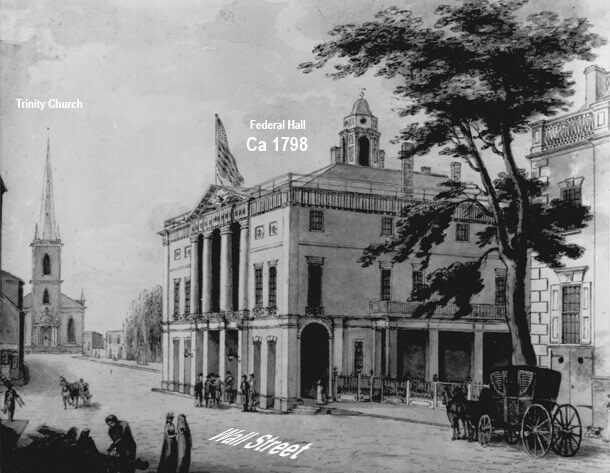 Federal Hall is on the list of America's "National Register of Historical Places" since 1966. The building's design brings to mind both ancient Greece and ancient Rome. The building resembles the Pantheon in Rome. April 23, 1903 the Stock Exchange opened in the same magnificent buildning of today, main buildning at 18 Broad Street in the corner of Wall Street Exhange PI. The room where you negotiate is at 11 Wall St. The buildning at 18 Broad Street consist of six big pillars (today these are covered by the American flag, 2006). At the top of the buildning you can see six different sculptures who are representing as for example, agriculture, research, industry etc. Around the sculptures there are waves from the ocean that shall represent the effects that can happend at the stock exhange. New York Stock Exchange handle most dollars in the world by volume and are in second place in number of companies. 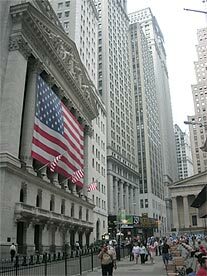 Due to the act of a terrorism attack Sept 11, 2001 the Stock Exhange are closed for the public (2006). Also known as "Charging Bull" or "Wall Street Bull". This big bronze statue of a bull is standing in Bowling Green Park. It was created by the artist Artuor Di Modica 1989 and was placed illegaly outside the New York Stock Exchange. He created this in memory of the "Black Monday" (Oct 19, 1987), that day the stock market went down with 22.6%. The Police should transport the Bull away but the public protested and eventually it was decided to move it to a certain place were it could remain, the place was in Bowling Green Park. The church is the oldest one in New York. The first church was built already 1698 after approval from King William III of England. The church of today was built 1846. The steeple with it´s spire dominated those times skyline and was a welcoming view for incoming ships. Today the church are surrounded by skyscrapers. Fun facts: For those of you who have seen the movie "The National Treasure" with Nicolas Cage also know that it was underneath the Trinity Church, they found the great treasure that whole movie is about.